Working on The RE Store’s field crew is a lot like digging for buried treasure. It’s a dirty, dusty, splintery business, and it’s often done at a fever pitch. While we travel to many exotic locales in our never-ending quest for architectural gold, there’s nothing better than striking it rich in our very own backyard. This September, we unearthed a treasure trove of vertical grain Douglas fir tongue-and-groove flooring just blocks away from our Ballard store location. It was buried deep under a musty layer of avocado green shag carpeting. Thankfully, the previous owner saw past the luxurious fad of that deep pile rug and didn’t bother to tack it down. This single visionary action left the fir beneath it in as good-as-it-gets condition. Eternally thankful, we set to work with our trusty Burke bars in hand (top left in image above). Unlike today’s wood flooring, which is typically installed with the benefit of pneumatic nail guns, this stuff was done ye old-fashioned way. Imagine if you will, a carpenter setting each nail in each board by hand with a hammer. Every time we pull up a floor of this vintage we give thanks that we weren’t the ones who had to install it. However, removing fir flooring is no picnic either. Flooring of this type is nailed through the tongue when installed, and it must be removed by prying at each nail from the tongue side. Fir is a soft wood that often becomes brittle with age, so special care must be taken to avoid breaking the tongue upon removal. Take it from someone who knows, breaking the tongue renders the piece unusable again as flooring. Listening to the sound that the board makes during removal is actually one of the best indicators of whether or not it will come out intact. The more screeching nail sounds the better. After listening to the soothing sounds of the fir floor, we moved on to unearth a number of other treasures from the Ballard house, including: cast iron pedestal sinks, divided light windows, cedar fence boards, and even some Volkswagen Beetle windshields. While our mission is to salvage reusable building materials, we’re always on the hunt for re-purposeable treasures to bring to you, the RE Store supporter. 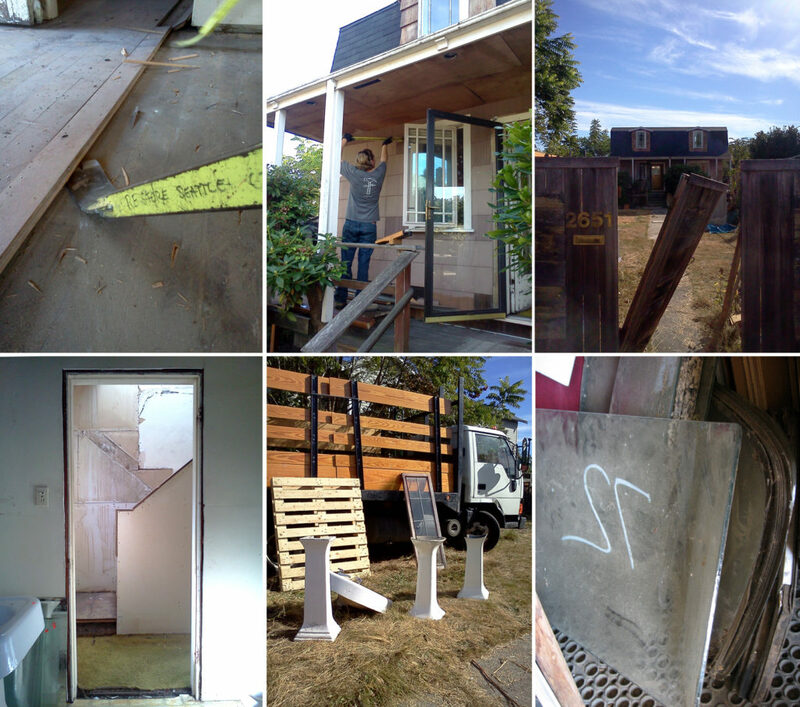 This time around, we managed to dig up pieces of Ballard, which we hope have found new homes by now. The VW windshields, however, are still available as of this writing; please inquire at The RE Store in Seattle for more information.